NASA's first space-bound Orion crew capsule on display in Kennedy Space Center's Operations and Checkout (O&C) Building in Florida, July 2, 2012. The spacecraft is set to launch on an unmanned test flight in 2014. CAPE CANAVERAL, Fla. — Without a heat shield or wiring, and with only welded metal panels to see, NASA's new spacecraft designed to take astronauts out beyond Earth and into the solar system doesn't look like much yet. But to NASA, congressional and space industry leaders, the capsule's olive-green pressure shell is an exciting sight to behold. 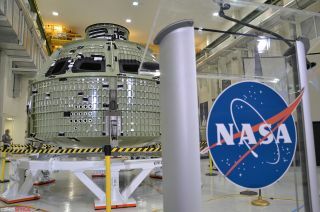 The capsule, NASA's first space-bound Orion crew module, was unveiled today (July 2) to mark its arrival at NASA's Kennedy Space Center here, the site of the spacecraft's planned 2014 launch on an unmanned test flight. "We are really proud of it," NASA Deputy Administrator Lori Garver told SPACE.com. "It is going to start looking more like the shape of capsule soon. But to me, it looks like the future." The Orion capsule, which arrived in Florida from the Michoud Assembly Facility in Louisiana last week, now sits inside Kennedy's Operations and Checkout (O&C) building. It is in here, the same high bay where more than 40 years ago NASA readied similarly-shaped capsules for launches to the moon, that Lockheed Martin engineers and technicians will conduct the final preparations to launch this Orion higher and faster than any capsule since the Apollo moon missions. Cabana said the Orion's unveiling was aptly timed since it came one day after the 50th anniversary of the Kennedy Space Center, which has been NASA's home port for manned space launches for decades. "This is a milestone moment for the Space Coast, NASA and America's space program," Garver said. "It is a new and exciting chapter in America's great space exploration story, one that will see more discoveries, more scientific return and more people and Americans going into space and going places that have never before been visited." The first manned launch of an Orion space capsule atop its main rocket, the Space Launch System, is targeted for 2021. NASA retired its storied space shuttle fleet last year after 30 years of service. The Orion's spacecraft olive-green aluminum-lithium metal panels are still to be covered by an advanced version of the thermal protection tiles that were earlier used on the space shuttle. The Orion Exploration Flight Test-1 (EFT-1) capsule is NASA's first spacecraft designed for human spaceflight to undergo final assembly at the Kennedy Space Center in Florida. Image taken July 2, 2012. The uncrewed Orion test flight, which NASA calls the Orion Exploration Flight Test-1 (EFT-1), is slated to launch in spring 2014 atop a United Launch Alliance Delta 4-Heavy rocket from the Cape Canaveral Air Force Station. After reaching orbit, the capsule will circle Earth twice, rising to more than 3,600 miles (5,800 kilometers) from the planet — 15 times higher than the International Space Station. The Orion spacecraft will then turn around and come home, re-entering the atmosphere at a blazing speed of more than 20,000 mph (32,000 kph) in an attempt to prove that its heat shield is capable of protecting the capsule — and its future crews — after missions to an asteroid, the moon, and ultimately Mars. "We are going to get about 84 percent of a lunar entry velocity, which is really going to stress the heat shield, which is exactly what we're trying to do," said Mark Geyer, NASA's Orion program manager. The EFT-1 mission will end with the Orion splashing down in the Pacific Ocean, off the coast of the United States. Kennedy Space Center (KSC) director Robert Cabana said: "As KSC celebrates its 50th anniversary I can't think of a more appropriate way to celebrate than by having the very first Orion crew vehicle here. Orion is ushering in a new era of space exploration beyond our home planet, enabling us to go further than we've ever gone before." Image taken July 2, 2012. By the fall of 2013, Lockheed Martin, NASA's lead contractor for Orion, plans to have the 16-foot wide (5-meter) capsule completed and looking more like a typical spacecraft. Its metal panels will be covered by an advanced version of the thermal protection tiles used on the space shuttle, and the capsule's belly will be covered with a modern variant of the ablative heat shield used on NASA's Apollo spacecraft. "There are people ready with drill bits, and tubes, and pipes to start assembly of this vehicle as soon as we're out of here and out of their way," said John Karas, Lockheed Martin's vice president for human space flight. The Orion will also be equipped with avionics systems and other instrumentation to fly and record the data from the flight test. What the EFT-1 capsule will not have is the digital glass cockpit, crew seats, life support systems (including a planned toilet), or the solar panel wings that future, manned Orion capsules will require. These systems will be included on later test vehicles set to launch on NASA's next heavy-lift booster, a giant rocket called the Space Launch System. The Space Launch System, which was authorized by Congress last year and is under development now, is being designed to support both crew and cargo launches to destinations beyond low Earth orbit. NASA is targeting its first unmanned Space Launch System flight for 2017, with the first manned Orion flight to follow four years later. Robert Z. Pearlman is the editor of collectSPACE.com, the leading online space history publication and a SPACE.com partner. You can follow @robertpearlman on Twitter or on Facebook. Follow SPACE.com on Twitter @Spacedotcom and on Facebook.